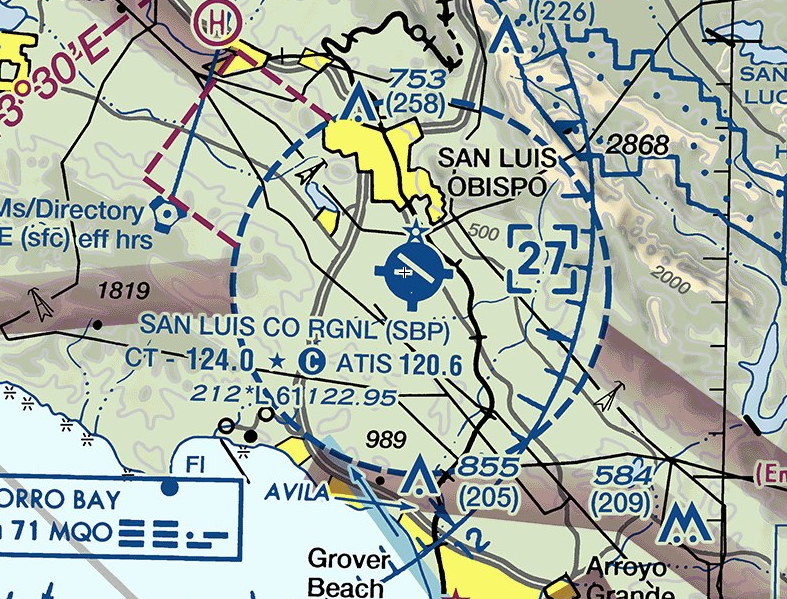 Conduct 3 laps of the traffic pattern at San Luis County Regional Airport (KSBP). Become familiar with radio communications during pattern operations at a Class D airport. Demonstrate the ability to fly a traffic pattern. Inform ATC on initial contact at KSBP that you are performing the CAT-3 Rating. KSBP is located in Class D airspace. In order to operate in Class D airspace you must establish two way radio communication with ATC by calling them and having them reply with your callsign. When departing from a towered airport you will need to contact ground control prior to operating on any movement area (any taxiway or runway). Prior to calling get the ATIS. When calling ground include your callsign, location, direction of departure, and the ATIS code. Ground will issue a runway assignment and a taxiway route. You are required to read back the runway assignment, and it’s a good idea to read back the taxiways as well. When you are at the end of the runway you can switch to tower frequency. Note unlike when arriving you are allowed to switch to tower without the ground controller specifically telling you. The tower controller may ask you to “Report midfield downwind,” or “Report base.” Make your reports as appropriate, but only if requested by the tower controller. © a full stop landing, which only permits you to conduct a full-stop landing (e.g. “Runway 29, cleared to land.”). You are required to conduct 3 laps in the traffic pattern to complete this rating. During the 3rd lap, or whenever you decide to make a full-stop landing, advise the tower controller of your intentions to make a full-stop. If you have already been cleared for the option, the tower controller is not expected to re-issue a landing clearance, because a clearance for an “option” permits you to make a full-stop landing. After landing use the communication procedures detailed in the CAT-02 flight to return to the ramp. The tower controller’s job is to ensure runway separation will exist for all departures and arrivals. The tower will also issue traffic information and sequencing. Here are some examples. If you have the traffic in sight, report it in sight. If you don’t, advise that you are looking for the traffic. Advise Tower if you have the traffic in sight. If you don’t, advise Tower you are “looking for traffic.” Once you report the traffic in sight, expect your landing or option clearance. SBP Tower: Skyhawk 3AB, number 3, follow Cirrus ahead on downwind." In this situation, you would be expected to follow the Cirrus. Adjust your speed or the length of the downwind leg as necessary to do so. Do not make a 360 unless approved by Tower. Tower may also instruct you to extend your downwind. The tower will advise you when to turn base. This will usually accompany your sequence and a landing clearance, too. When clear of the runway. After switching to ground frequency.